i suggested to my husband today that we drive down by some junkyards and abandoned factories on the south side of peoria to see if we could find an owl, and we found one! 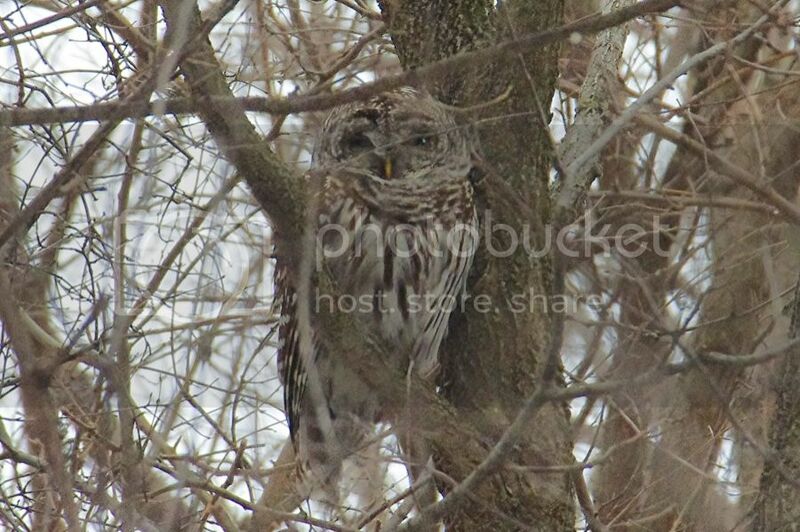 another barred owl. my 2nd since the 1st of the year. Barred owls are my favorite. Nice pics! I agree, I love listening to them right before sunset!!! I know a guy with a horned owl that he found as a baby. It’s 2 years old now and eats rats from the pet store. It’s highly illegal but the owl is tamed and totally dependant on humans for food. Sad really! Can’t imagine keeping something like that caged up. Not to mention what it could do to your face if it gets a notion to attack! He may be on that tv show some day when it gets him!! lol! My old man had a barred owl he caught as a chick when an old tree fell in his neighborhood…which was back in the mid ‘30s. Back then you could buy a whole beef kidney at the Pigley Wigley for 5 cents…and that is what he fed it. They used the owl for crow hunting….said the crows would fly down the gun barrel over that owl. I remember him telling me a story of how a kid in the neighborhood claimed that his pet white rat…which was huge…would be too big for the owl and they bet a quarter over whose pet would punk the other out. About the time they decided the rat was too big for the young owl. it swooped out of the rafters of the old smoke house dad kept him in and grabbed the rat. All the rat did was squeak as the young owl flew up to his perch and started eating him. See what you get to do without T.V. and video games?! Over time because of the depression and the economy the beef kidneys got scarce…there were no sparrows, or “spatseys” as he used to call them because he had trapped all of them as well for owl food…so he had to release it. He said it hung around the neighborhood for a day and left. I have one picture of him, and the photos of the owl in the post reminded me of my dad’s. Good pictures indeed. when i was in high school in nebraska there was a guy that had a pet owl. he used to bring it to school dances perched on his shoulder. Jedro…very cool story about your dad. Sounds like a great memory. I was blessed to have a father who along with his, was entrenched in the outdoors…back when few were doing that. In those days there were lots of hedge rows. quail were abundant, and the first time someone came in to tell a story about seeing a deer in the Bear creek bottoms (west of Taylorville) everyone called the guy a liar. Model 12’s, rubber deeks, and floating the north and south forks of the Sangamon and jump shooting ducks. No coyotes to have a coyote drive for…but fox drives instead. In the first couple month’s after quail season ended (no pheasants around either, you had to go up to Gibson City for that)his bunch would take their tricked out varmit guns out (my old man’s was a 1885 high wall winchester customized with a bull barrell, set triggers, and a 10x unertyl scope in .219 ackley improved zipper)road hunting…which was legal back then…and look for crows..and yes…see how many “chicken hawks” they could shoot because back then, that was an accepted practice, and most folks thought that birds of prey consumed a quail or furred game diet…instead of mainly rodents as we know today. I have the old log books that he kept of what they killed. Things have really changed…and are going to keep on changing. I am sure that in 30 or 40 years, what we have today will be nothing like what is coming. 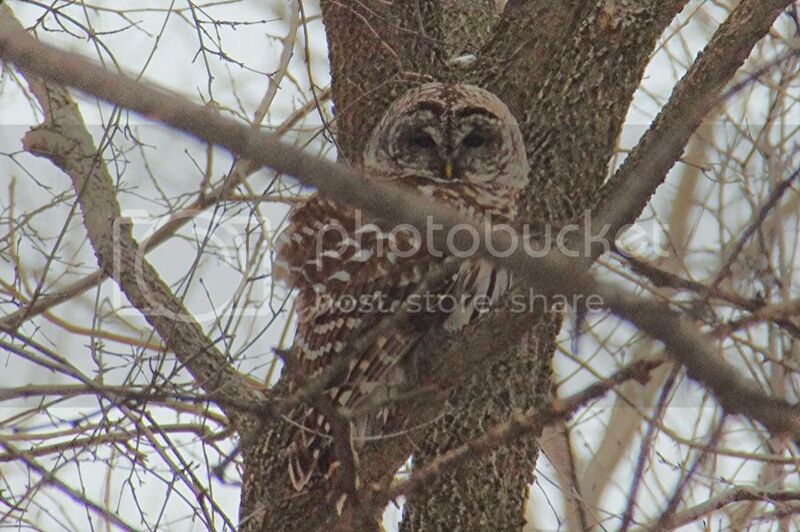 Back to the owl…he and his buddy found two of them…but his buddy fed his pieces of hot dog and it died. That is one thing that has not changed…hot dogs still ain’t good for anything!